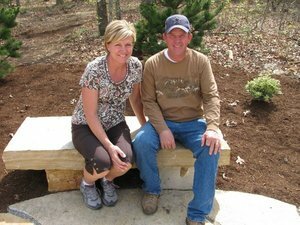 Kelley Thomas Landscape & Nursery is a family operated business that was started by the husband and wife team of Kelley and Lisa Thomas. Kelley and Lisa operated a lawn and landscape nursery in Canyon Texas from 1983 to 1996 prior to moving their family to Mountain Home, AR. They opened the doors of Kelley Thomas Landscape & Nursery, their new retail nursery and garden center, in 1996. Altogether, they have 26 years of lawn and landscaping experience and look forward to helping you fill the gap between an average yard and a magnificent yard. The Mountain Home nursery and garden center rests on 5 acres of land and is filled to its perimeters with trees of all sizes, shrubs, perennials, annuals, ground covers, hanging baskets, concrete statuary, decorative iron, bulk landscape products, mulch, plants, dirt and landscaping rocks. Kelley and Lisa take great pride in the landscaping services that they provide. They can do it all including landscape renovation, pond building and sprinkler system installation. In 2015, Kelley and Lisa were able to expand the business and opened a new location in Mountain Home, the Kelley Thomas Garden Center and Gift Market, located at 1817 Highway 62 East. The Garden Center has plants, trees, shrubs and accessories, and the Gift Market has candles, jewelry, clothing, home decor, yard ornaments and much more. Our experienced, friendly garden center and landscaping staff are eager to assist you with all your planting needs. Our team will go the extra mile to help you build the landscape of your dreams for your home or business. We all love what we do and it shows in our completed work.